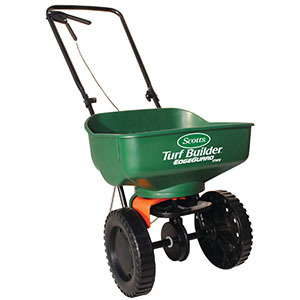 Our top pick for the best lawn spreader is, who else, Scott’s Turf Builder. This EdgeGuard Mini Broadcast Spreader is able to hold enough fertilizer to take care of up to 5,000 square feet at the same time with a simple to use unit to go with it. The spreader itself is easy to operate with two large plastic wheels and a pull bar at the top for distributing the fertilizer itself. As you push it along it will slide easily and the fertilizer will be spun directly out from the bucket to the grass around you at a high rate of speed so you don’t have to slow down. This unit is ready to use right away and uses exclusive EdgeGuard technology from Scott’s. All of the fertilizer is thrown out in a steady form to make sure that it’s even spread throughout your grass and you don’t have patches of dead or dying grass amongst the beautiful grass you really want. Weighing only 15 pounds, this unit is easy enough for most people to maneuver or even carry from one location to another. 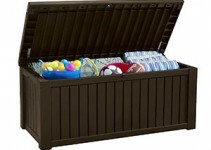 It also is smaller than other units, which makes it easier to store when you’re done or even for the entire winter while you wait for your grass to start growing again. This spreader is a smaller version of the DLX and is designed for smaller yards as well as easier movement when needed. It has a low price and therefore can be considered by the average person for improving their lawn and their entire home. This lawn spreader gives you a wide spread of fertilizer but cuts off on the right side so you can get a straight edge all the way through. You won’t have to worry about getting fertilizer on your sidewalks or driveway as much because of this edge or in flowers or other areas that you don’t want it. One drawback on this spreader is that it uses open sided plastic wheels that can catch some of the fertilizer that is being dispersed inside. When the fertilizer starts to build up it then slides off in different parts of the yard, which can lead to burning while areas that don’t get enough because of this clumping may not grow quite as well. There also may be some calculation needed in order to use different types of fertilizer because there is no specific pounds to square feet settings in the system, which means that you need to do a little math to figure out how much of each type of fertilizer you put in. This is only for those fertilizers that aren’t specifically made for this product or have instructions for it but that can make things more complicated. Because this is small it works better for those who have smaller areas to fertilize or salt because you don’t have to haul around a large unit while you’re going or worry about the weight of all that fertilizer or salt, especially if you’re not even going to need it. For areas where there is a large lawn or a large amount of sidewalk for salt or anything else, it can still be a good choice because it’s easier to handle than a larger unit. This unit works for just about anything that comes in a pellet form including insect repellent’s , salt and fertilizer and has no problem getting a nice, even spread for each type of product throughout the area that you want it. This helps keep your entire property in better shape. 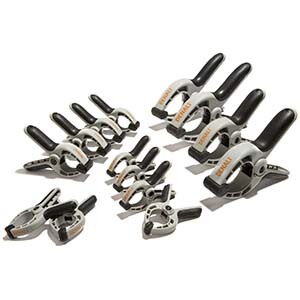 There are several different bundles available for this unit that vary in size and type. Each of the packages comes with the Turf Builder itself while sometimes combining them with specific fertilizer types and sometimes bug products as well. Those who are looking for a unit that will spread fertilizer throughout their yard without them having to do so manually will appreciate this unit as will those who have a smaller yard but still want to get a good amount of green grass throughout. It spreads the fertilizer needed very quickly and easily, which makes it easier for those who have never used this type of product and may be elderly. 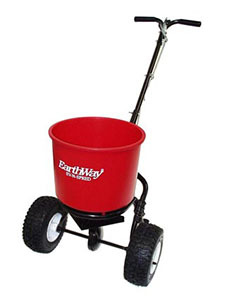 Those who have grass they want to keep green in the summer or sidewalks they want to keep clear of ice in the winter will find that this spreader actually works for both purposes because of the spreader style and the small size that allows it to roll over sidewalks and driveways easily. It can also be used with different types of bug repellants (in pellet form) and will roll easily through higher grass or short grass. A good lawn spreader is one that will apply the product evenly without a whole lot of added work or needs from you. It should be able to throw out a variety of different materials to keep your property in the proper shape whenever you need it without clogging or spreading too thickly at the same time. Your spreader should also be easy to push or carry along with you because it should be relatively lightweight as well as having large enough wheels to move through different materials and environments. The spreader should hold a decent amount of fertilizer for your specific yard, ensuring that you have minimal refills necessary to get the job done entirely. It should be easy enough to calibrate so you can get it ready and going as quickly out of the box as possible without compromising on the accuracy of the unit itself. You should also be able to use the type of fertilizer or other products that you want in the unit without having to worry about it spreading too thick or too thin because of the format and style of the unit. You should be able to walk comfortably and easily behind the unit without having to push excessively hard to get it to move on different materials including grass or your sidewalk. You also shouldn’t feel as though you have to walk excessively fast in order to keep the unit from spreading too much in one small area. The wheels can be made of different materials and though plastic is generally not the best option, it can be a good choice because it moves fairly well through grass. If you’re not careful these types of wheels can result in clumping of fertilizer and therefore must be watched a little more closely to make sure there is no extra dropage in some areas. Finally, you should be able to get the fertilizer out very easily while you’re walking without having to use a lot of effort. You should be able to just push it along and either pull a type of lever or push a button that releases the fertilizer in a consistent manner. In order to choose a lawn spreader we start by looking at the favorites and most popular options and start to narrow down a list. Once we’ve done this, we start conducting research to figure out the most important aspects of the product to those who use it and apply those to what products we have left. Next, we start to whittle down the list of possibilities by looking at what products meet most, if not all, of the qualifications we’ve set but aren’t priced so high that the average person wouldn’t be able to buy it if they really needed one. That way we know better what you will probably be looking for when you’re trying to find the right unit. Finally, we make sure to talk with people who use these types of spreaders frequently and for different purposes to make sure we’ve chosen what’s most important to them and to you. Cleaning is an important aspect to keeping your lawn spreader in proper working order. If you clean it out frequently you won’t have to worry about the fertilizer getting clogged or stuck inside and you don’t have to worry about staining or problems with the materials of the unit either. By following the maintenance tips you’ll be able to keep using this unit for a long time. The same happens when looking at the safety rules, which you should make sure you always follow in order to get the most out of your spreader and keep yourself safe at the same time. Overall, the Scott’s Turf Builder is definitely a good unit for those who have trouble keeping their lawn in the best shape. It allows you to improve the quality and look of your lawn so you can enjoy it all summer. But this unit also allows you to enjoy your sidewalks and driveways in the winter, or your house all year round, because it can be used for any type of pellet material. You’ll get more than you bargained for with this one every time you use it, which is definitely a good thing. You will be able to keep your lawn clean and green throughout the summer months and will also be able to keep your sidewalks clear during the winter months without the hassle of several different types and pieces of equipment. 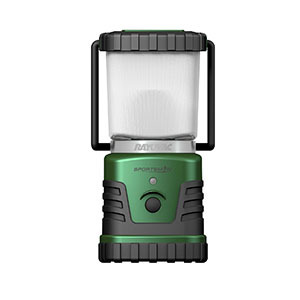 You can just use this one tool to help you with the problems that you would otherwise face with a slew of different types of equipment.